Brentford and Exeter are still dreaming of Wembley after sharing the spoils in the first leg of the Johnstone's Paint Trophy southern area final. Jamie Cureton struck first for Exeter before the break when he hit an angled drive across Bees keeper Richard Lee. But the Londoners equalised on 64 minutes when Gary Alexander swept home Myles Weston's first-time cross. Weston almost won the match for the hosts, but his header bounced to safety off the upright. Paul Tisdale's side always looked threatening, with Daniel Nardiello forcing Lee into a string of impressive saves. Exeter midfielder Liam Sercombe also went close for the visitors but his curling effort was saved by Lee at full stretch. "It's a draw and we're evens, and we're now going back to St James Park, so I'm just happy with the way we played. "Of course I would have liked to have not conceded the equaliser but so be it and it's going to make a very good second tie. "We defended very well and we conceded a goal second-half to good pressure from them and we didn't quite deal with it." 90:00+3:16 The final whistle is blown by the referee. 90:00+2:28 Corner taken by Billy Jones played to the near post, Gary Alexander manages to make a clearance. 90:00+2:15 Jamie Cureton takes a shot. Blocked by Pim Balkestein. 90:00+1:13 Nicky Forster challenges Richard Duffy unfairly and gives away a free kick. Paul Jones takes the free kick. 90:00+0:41 Inswinging corner taken from the left by-line by Marc Laird, Matthew Taylor manages to make a clearance. 89:49 The official flags John O'Flynn offside. Richard Lee takes the indirect free kick. 87:07 Marc Laird takes the inswinging corner, Foul by Toumani Diagouraga on Troy Archibald-Henville, free kick awarded. Paul Jones takes the free kick. 85:28 Gary Alexander gives away a free kick for an unfair challenge on Matthew Taylor. Free kick taken by Paul Jones. 84:57 Liam Sercombe produces a left-footed shot from just outside the penalty area that goes harmlessly over the target. 84:09 Toumani Diagouraga challenges James Dunne unfairly and gives away a free kick. Billy Jones delivers the ball from the free kick left-footed from left wing, save by Richard Lee. 84:09 Booking Toumani Diagouraga is shown a yellow card for unsporting behaviour. 78:53 Corner taken by Billy Jones from the left by-line to the near post, Troy Archibald-Henville takes a shot. Save by Richard Lee. 78:18 The offside flag is raised against Gary Alexander. Free kick taken by Paul Jones. 76:25 Troy Archibald-Henville takes a shot. Save made by Richard Lee. 74:59 Substitution Troy Archibald-Henville replaces David Noble. 73:38 Headed effort from close in by Myles Weston bounces off the post. 71:05 Outswinging corner taken from the right by-line by Marc Laird, David Noble manages to make a clearance. 69:43 Inswinging corner taken right-footed by Marc Laird from the left by-line, Headed effort from deep inside the penalty area by Michael Spillane goes harmlessly over the crossbar. 67:28 The referee blows for offside against John O'Flynn. Free kick taken by Richard Lee. 67:28 Substitution Daniel Nardiello goes off and Billy Jones comes on. 64:19 Effort on goal by Marc Laird from long range goes harmlessly over the bar. 63:22 The assist for the goal came from Myles Weston. 63:22 GOAL - Gary Alexander:Brentford 1 - 1 Exeter Gary Alexander fires in a goal from inside the six-yard box low into the middle of the goal. 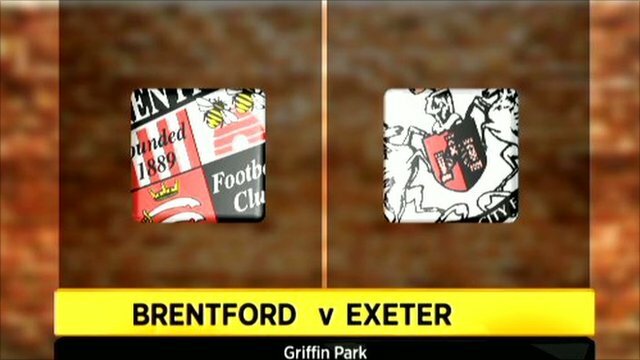 Brentford 1-1 Exeter. 62:50 James Dunne is penalised for a handball. Free kick taken by Richard Lee. 62:14 Free kick awarded for a foul by Gary Alexander on David Noble. The free kick is swung in right-footed by David Noble. 61:42 Liam Sercombe takes a shot. Save made by Richard Lee. 61:20 Corner taken right-footed by Daniel Nardiello to the near post, clearance by Marc Laird. 61:01 Daniel Nardiello takes a shot. Save by Richard Lee. 60:32 The referee penalises Michael Spillane for handball. Indirect free kick taken by Richard Duffy. 59:19 Outswinging corner taken right-footed by Marc Laird from the right by-line, John O'Flynn manages to make a clearance. 59:05 Myles Weston takes a shot. Steve Tully gets a block in. 57:18 Substitution John O'Flynn is brought on as a substitute for Richard Logan. 56:17 Outswinging corner taken from the right by-line by Marc Laird, Close range header by Leon Legge goes wide of the left-hand post. 56:17 Substitution Marcus Bean goes off and Toumani Diagouraga comes on. 54:53 Corner taken by Marc Laird from the left by-line, Matthew Taylor manages to make a clearance. 54:30 Jamie Cureton takes a shot. Blocked by Pim Balkestein. 53:01 The offside flag is raised against Jamie Cureton. Free kick taken by Richard Lee. 49:22 Liam Sercombe takes a shot. Blocked by Richard Lee. Correction - 48:20 David Noble gives away a free kick for an unfair challenge on Marcus Bean. Craig Woodman takes the direct free kick, A cross is delivered by Richard Duffy, save by Paul Jones. 48:20 Marcus Bean fouled by David Noble, the ref awards a free kick. Craig Woodman restarts play with the free kick, Richard Duffy crosses the ball, save made by Richard Lee. 47:19 Daniel Nardiello fouled by Marc Laird, the ref awards a free kick. Direct free kick taken by Richard Duffy. 45:51 Gary Alexander takes a shot. Matthew Taylor gets a block in. 45:00+3:15 The referee calls an end to the first half. 45:00+2:41 Corner from the left by-line taken by Marc Laird, clearance by Richard Logan. 45:00+0:58 Shot from close range by Daniel Nardiello misses to the right of the goal. 43:18 Free kick awarded for an unfair challenge on Steve Tully by Myles Weston. Indirect free kick taken by Paul Jones. 41:50 Pim Balkestein concedes a free kick for a foul on Richard Logan. David Noble takes the indirect free kick. 40:16 Handball by Nicky Forster. Free kick taken by Paul Jones. 38:30 Assist by Richard Logan. 38:30 GOAL - Jamie Cureton:Brentford 0 - 1 Exeter A goal is scored by Jamie Cureton from inside the penalty area to the bottom left corner of the goal. Brentford 0-1 Exeter. 36:52 Unfair challenge on Richard Duffy by Gary Alexander results in a free kick. Paul Jones takes the free kick. 34:38 Free kick awarded for an unfair challenge on Nicky Forster by Steve Tully. The ball is swung over by Marc Laird, Close range headed effort by Nicky Forster misses to the right of the target. 33:46 Free kick awarded for an unfair challenge on Kevin O'Connor by David Noble. Indirect free kick taken by Richard Lee. 32:09 James Dunne concedes a free kick for a foul on Nicky Forster. Richard Lee takes the free kick. 28:10 Inswinging corner taken right-footed by Marc Laird from the left by-line, clearance made by Richard Logan. 25:48 Corner from the right by-line taken by Marc Laird, Effort on goal by Marcus Bean from deep inside the penalty area misses to the right of the goal. 24:53 Corner taken by Daniel Nardiello from the right by-line to the near post, Marc Laird makes a clearance. 24:30 Daniel Nardiello takes a shot. Save by Richard Lee. 22:45 Corner from the left by-line taken by Marc Laird, Richard Duffy makes a clearance. 20:31 James Dunne fouled by Gary Alexander, the ref awards a free kick. Paul Jones takes the free kick. 20:31 Booking Booking for Gary Alexander. 19:47 The assistant referee flags for offside against David Noble. Richard Lee restarts play with the free kick. 19:27 Jamie Cureton takes a shot. Blocked by David Noble. 17:27 Marcus Bean is penalised for a handball. Free kick taken by David Noble. 14:51 Richard Logan takes a shot. Richard Lee makes a save. 12:38 Corner from the right by-line taken by Daniel Nardiello, Gary Alexander makes a clearance. 12:24 Daniel Nardiello takes a shot. Save by Richard Lee. 8:31 Daniel Nardiello takes a shot. 6:18 Free kick awarded for a foul by Daniel Nardiello on Michael Spillane. Free kick taken by Richard Lee. 5:59 Effort from 18 yards by Gary Alexander. Save by Paul Jones. Correction - 5:25 David Noble concedes a free kick for a foul on Nicky Forster. Michael Spillane restarts play with the free kick. 5:25 Foul by David Noble on Nicky Forster, free kick awarded. Leon Legge takes the indirect free kick. 4:26 Corner taken right-footed by Daniel Nardiello to the near post, clearance made by Michael Spillane. 1:39 Richard Duffy fouled by Gary Alexander, the ref awards a free kick. Paul Jones takes the indirect free kick. 0:45 Effort on goal by Nicky Forster from deep inside the penalty area misses to the right of the target.